us taking our time and deciding on small details. One of the last big things we had to do was pick our cake. And this past weekend Josh and I did just that! On Sunday we met with Heather of Delectable Delights. From reading online and talking with people Heather comes highly recommended. She is the executive pastry chef at Penn State and runs her own cake business on the side. She also just had a baby. Talk about a busy woman! Her cake showroom is in her house and it is filled with truly beautiful cakes. For how many people we are having we were told this cake would be the perfect size for us. And bonus, the top layer is for Josh and I to keep and freeze to eat on our one year wedding anniversary! Heather was so nice and answered all of our questions thoroughly. You can tell she really knows what she’s doing. We also got to meet her new little baby boy who is adorable! Once we discussed design ideas and prices (which are super reasonable) it was cake sampling time! She sent us home with two mini cakes! We couldn’t wait to dig into them! First up was red velvet with buttercream frosting. 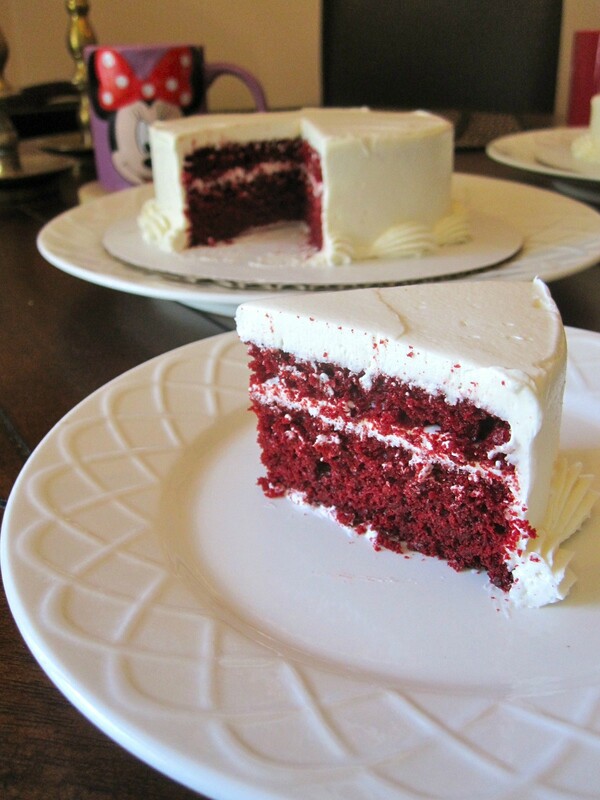 Red velvet is my favorite but I prefer it with cream cheese frosting. Due to health code issues Heather told us she doesn’t work with cream cheese when the cake is going to be sitting out for hours at a time (like at a wedding) because of the potential for someone getting sick. I totally understand that so we decided to pass on this one. Up next was a marble cake with chocolate ganache filling and buttercream icing. This was so incredibly amazing! The icing is so soft and sweet, the cake is super moist and flavorful, and the ganache is perfect. As soon as Josh and I tried this one we knew it was our wedding cake. We are going to have the whole cake done in this flavor combination. And that’s one more thing checked off our wedding list! The next big one is getting our Save the Dates printed and mailed out. It’s crazy to think we have less than 10 months until we’re getting married! And I have less than a week until my 22 birthday! Ahh, craziness! 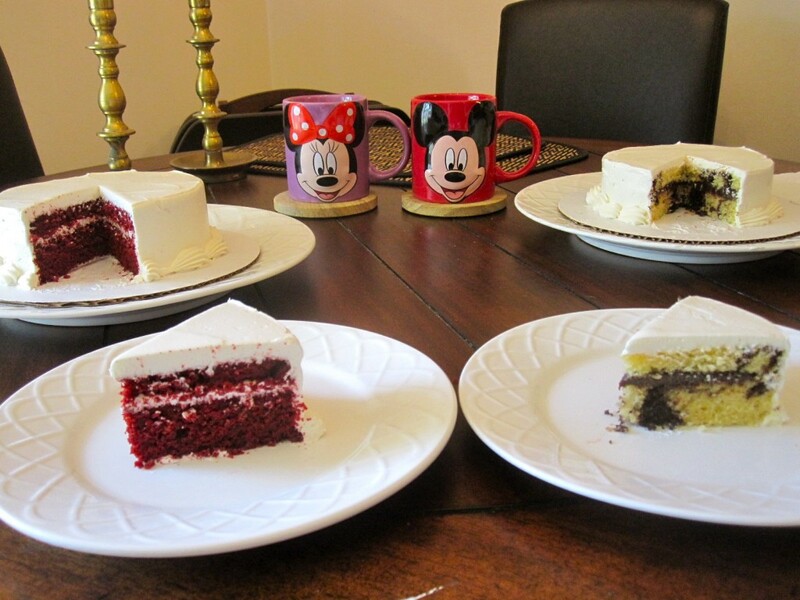 Question of the Day: What is your favorite cake flavor? Oh My RED VELVET GOSH! I need to renew my vows. Planning a wedding is so fun and exciting. I’m not a big cake fan but if I’m going to eat cake it has to be chocolate. Thank you so much! We’re having a blast planning! 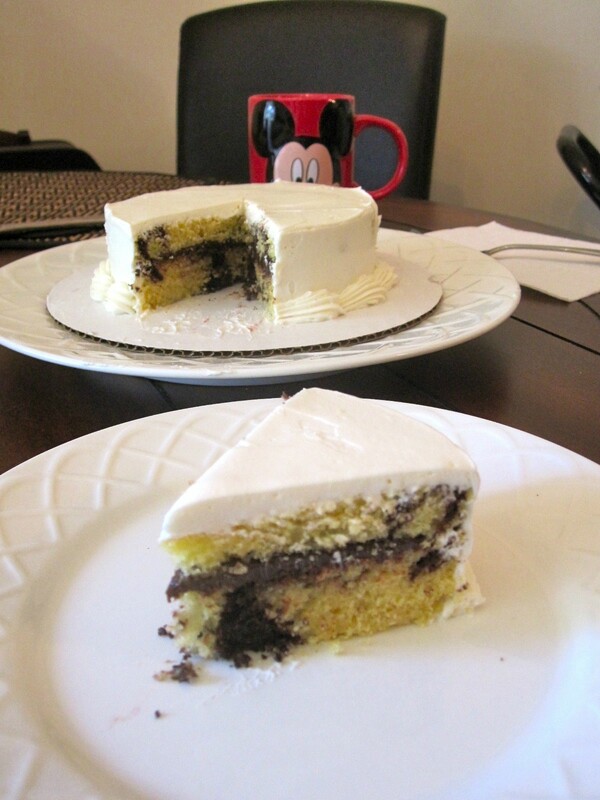 We’re hoping that by going with marble cake people can equally enjoy some chocolate and vanilla cake. what pretty cakes! thats so exciting!! i love ice cream cake the most (lol) but for normal cake, i love white w raspberry filling! spa love! Aw thank you! We’re so excited. And for birthdays ice cream cakes are my favorite! yum! I love marble cake! I can’t wait until Eric and I go cake shopping! I just want to try them all! I’m so excited for you, it is seriously so much fun!! Just make sure you time the meeting for when you really want cake. Ours was originally scheduled for 10am and we weren’t really hungry for sweets yet but thankfully we all got to chatting so long and then Josh and I went to lunch bc she told us we needed to let the cakes defrost that by the time we ate them it was like 1pm. My favorite cake is also red velvet but the bakery we went to doesn’t make them, so we got white cake with alternating fillings for the layers (ricotta and raspberry jam and ricotta and choc chips) sounds gross but it was pretty much a cannoli cake 🙂 and it tasted delicious a year later. Cake tasting was my FAVORITE part of wedding planning! It was so much fun! Now I’m excited for tasting our food! Oh yum! I absolutely LOVE red velvet!! So good! Our wedding cake was white cake or marble cake depending on the tier with raspberry/cream filling. So yummy! That sounds amazing! I love all the different options people have with cake! This looks like so much fun – what a great part of the planning experience. Looks like you chose a winning combo! How fun! We are so excited, it’s delicious! I too only like my red velvet with certain frostings. I never considered the whole issue with leaving a cake out for hours though! Yikes. 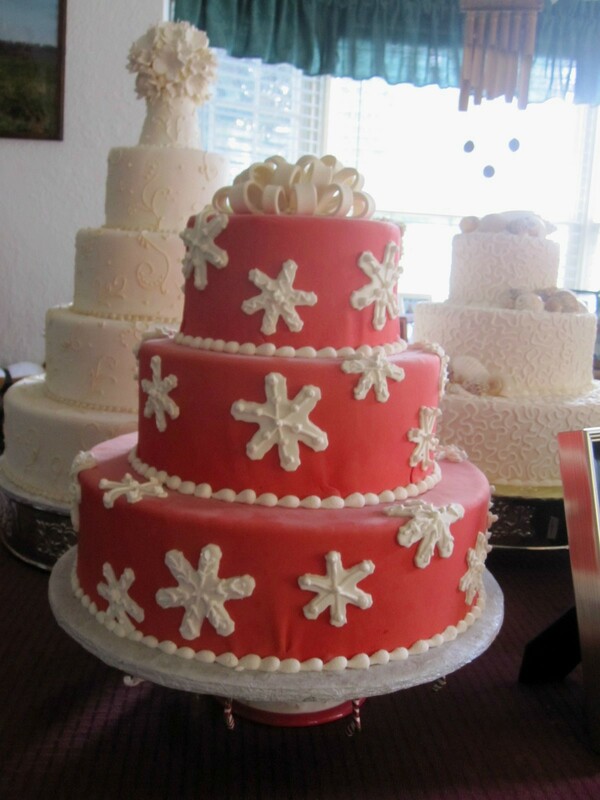 My all time favorite cake for weddings is Italian Wedding cake…dunno why it’s just amazing. Congrats on finding yours! Oh yum Italian wedding cake is delicious! Thank you so much, we’re so excited! Me either! I’m so glad she brought it up, as much as I would love red velvet I don’t want guests getting sick! Hehe, I always said that when I get married, everything else can fall on the wayside so long as I get an awesome cake and dress. Ohh pumpkin cake would be amazing! If only we were having a fall wedding!